Ed note: for the back story, please click HERE. OK, so where were we? I believe we left off yesterday having successfully doused the towering inferno – AKA the ‘Oh yeah, that’s right, in yo’ face, Doc’ cupcake as the apple pie and apple crisps finished baking. 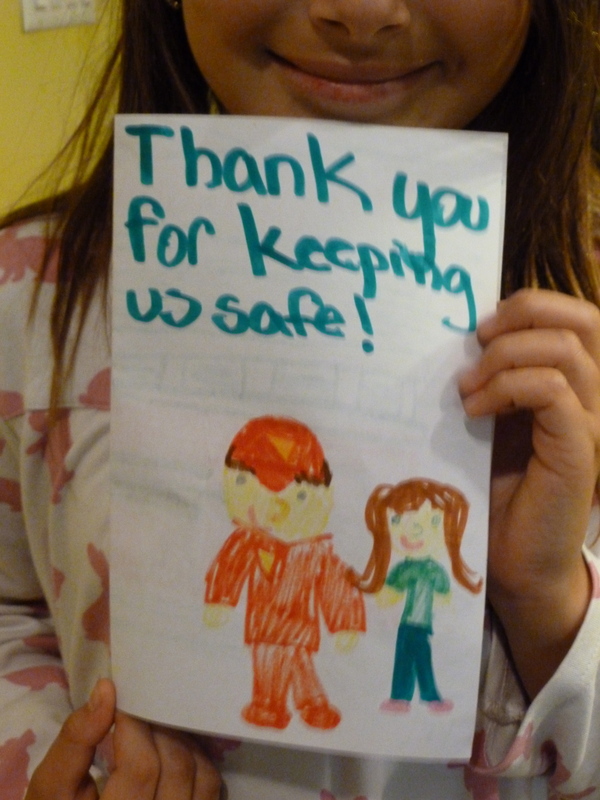 The girls set off to make cards for the firefighters while I finished cleaning up. Although this may seem like too small a detail to mention, I have to tell you what happened next. The girls went into the den together and they made cards. And I stayed in the kitchen and cleaned up. And for some reason I could not discern – perhaps the moon was in the seventh house? Jupiter aligned with Mars? (Anyone want to name the song?) No matter the reason, I’ll be damned if peace didn’t guide the planet (anyone?) because not once did I hear, “Mama, Brooke is yelling” or “Mama, she’s totally not listening” or “Mama, I need help!” from one or a pained “Nooooooooooooo!” from the other one. 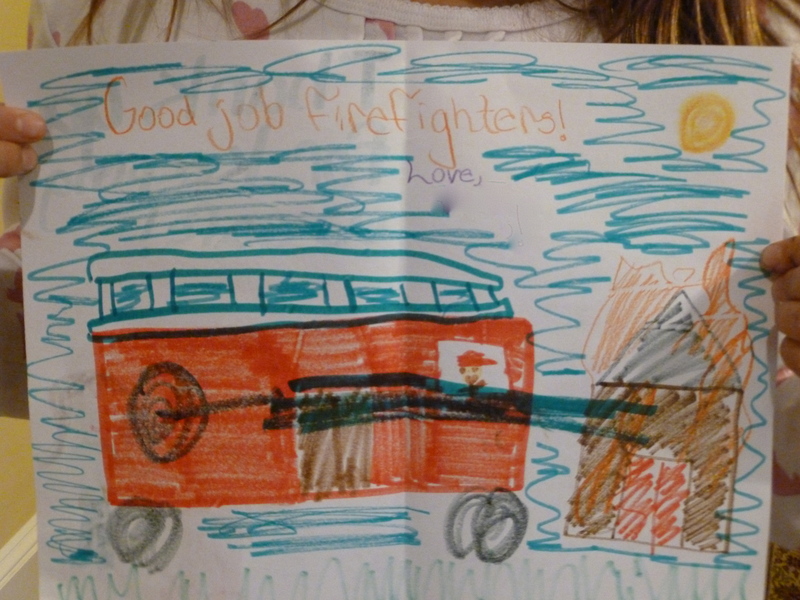 Middle of Katie’s card … I love that she not only took the time to draw the water shooting out of the fire truck and onto the burning house, but that she felt it important to add the bright blue sky and sun. Hey, guys, if you’re going to have to go risk your lives to fight a fire, we here at the Diary house really hope it’s a gorgeous day. I know I’m her mom and I know I’m not remotely objective, but seriously, how awesome is that? THAT is five years of OT, my friends. And for the record, this was a child who would / could not HOLD a writing implement of any kind in pre-school. How about them apples? 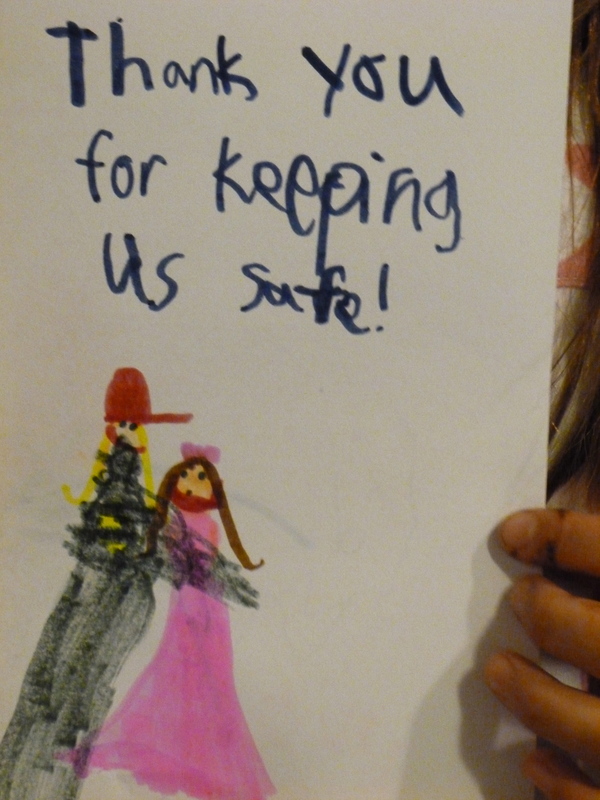 And not for nothin’, but can we talk about what she wrote inside her card (below)? Do you like fire fighting? Now, for the uninitiated, let me tell you why this matters. It matters because of this – Theory of mind. OK, moving on. So, cards and hot apple crisp in hand, we headed out. After a quick stop at Whole Foods for some eighteen carat gold ice cream (I just assumed because I can’t imagine why else they would have charged $9 for a quart of the stuff), we headed down to the local firehouse. When we got there, we wandered around for a while, completely confused. We opened doors, peeked around corners and even bumped into each other a couple of times. Had we carried on that way for long, I could have called the post The Keystone Cops visit the Firehouse. Finally, we opened the right door and found the crew gathered around a large table. The moment was initially awkward, but hot apple crisp and a quart of gold-plated ice cream broke the ice pretty quickly. That and a couple of really cute kids. Does the trick every time. Katie and I hung out at the door and chatted a bit with one of the guys. Brooke however, walked right in and began asking the firemen their names. One by one, she walked around the room, pointing at each of them so there would be no doubt who she was addressing when she said, “What’s your name?” “It’s nice to meet you, Mike. I’m Brooke.” Then the outstretched little finger would lead her to her next inquiry. “What’s YOUR name? “It’s nice to meet you, Joe. I’m Brooke.” And so on. Katie tugged at my arm. It’s a tug I know well. It’s the ‘MAMA, she’s embarrassing me’ tug. I looked down and smiled at her. “She’s fine, baby,” I whispered. “She’s fine.” Truthfully, I thought she was doing a whole lot better than fine. One of the guys asked if the girls would like to go see the trucks. Before I could so much as turn my head, they’d both shouted, “Yes, please!” so off we went. 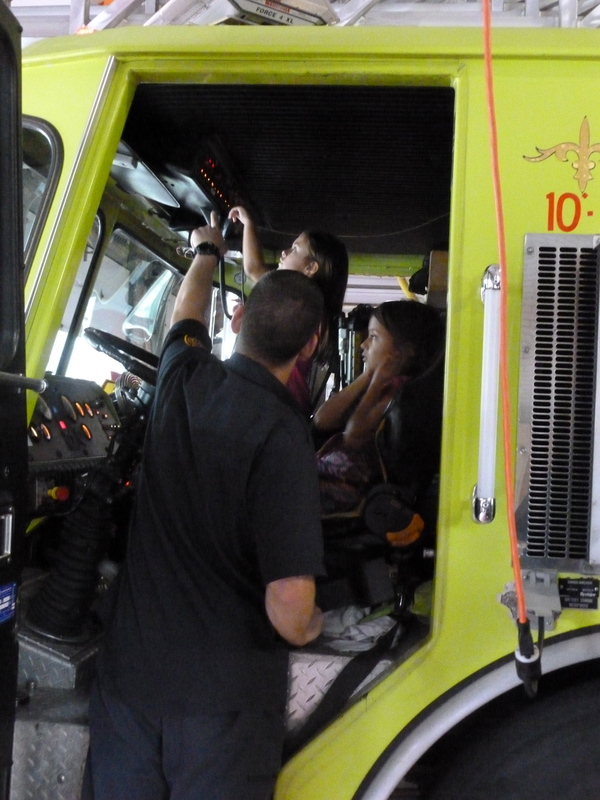 The girls were in heaven as Fireman Mike showed them around. He let them hold/ touch/ push/ pull /try on nearly anything in which they expressed an interest. 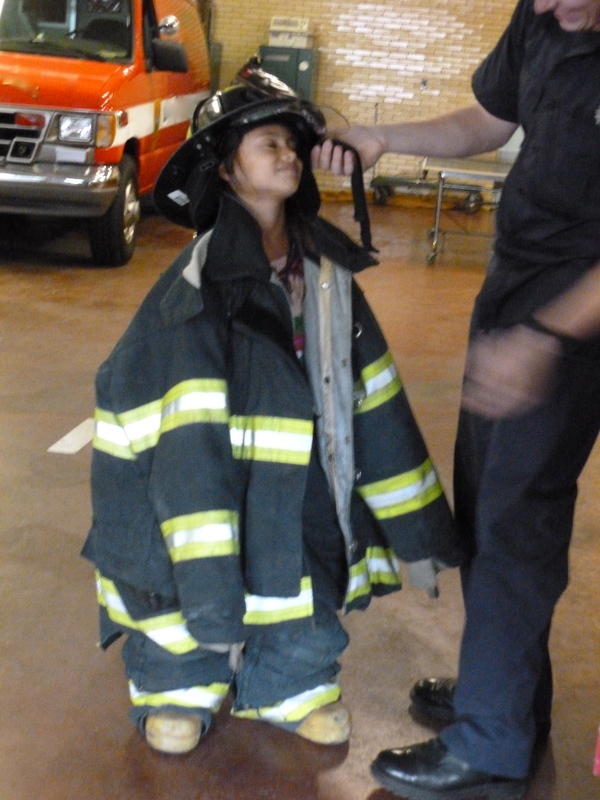 She was very excited when Fireman Mike showed up with the necessary accessories to complete the outfit. This would probably be an opportune time to tell you why I welled up as I took the photo above. You know those Touch-a-Truck events where local service groups and businesses bring their trucks to a big field and let the kids in town crawl all over them? Well, they sound great. Unless you have a kid for whom a field full of other kids screaming, laughing, crying, ringing bells, honking horns and setting off sirens may as well be the third ring of Hell. So this – well, this was big. 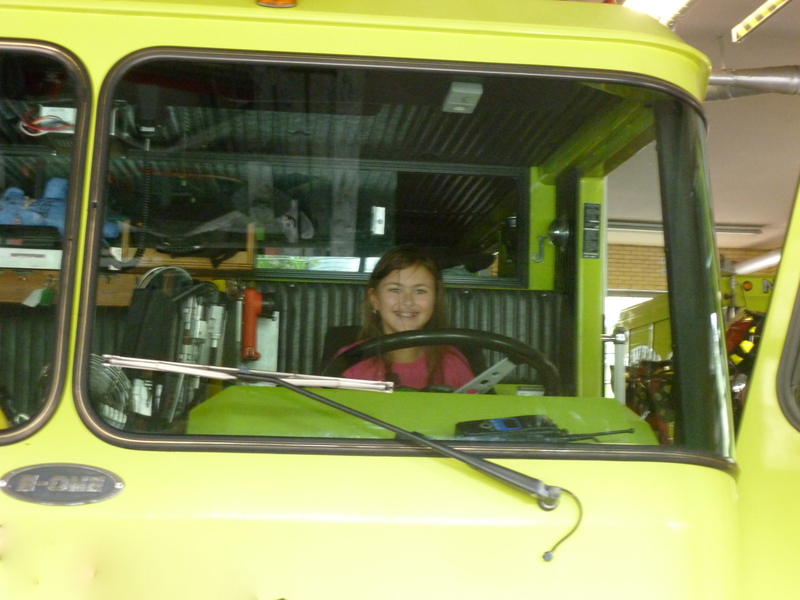 My baby got to check out the fire trucks all by herself. But that was just the engine. What about the ladder? Which was sweet, but made very little sense until a few minutes later when we were headed out. We thanked Mike profusely for his time. He thanked us for the apple crisp. And as we said our goodbyes, Brooke asked Katie a question. Loudly. Katie looked at me. I looked at her. Neither of us looked at Mike. And Brooke asked again. When we got outside, both girls still had smiles wrapped three times around their heads. I was about to ask them what their favorite moments had been, but Brooke had a question. Brooke looked smug as she answered. And suddenly it all made sense. Elmo. 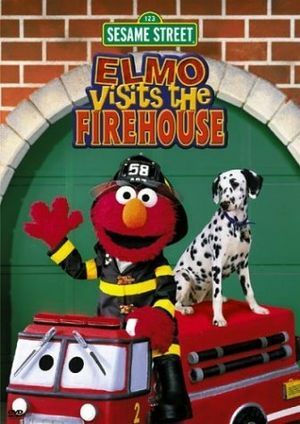 Elmo had hugged a firefighter. And now, in her own ingenious way, so had Brooke. That’s my kid. And that, my friends was our day at the firehouse. Thanks so much for coming along for the ride! 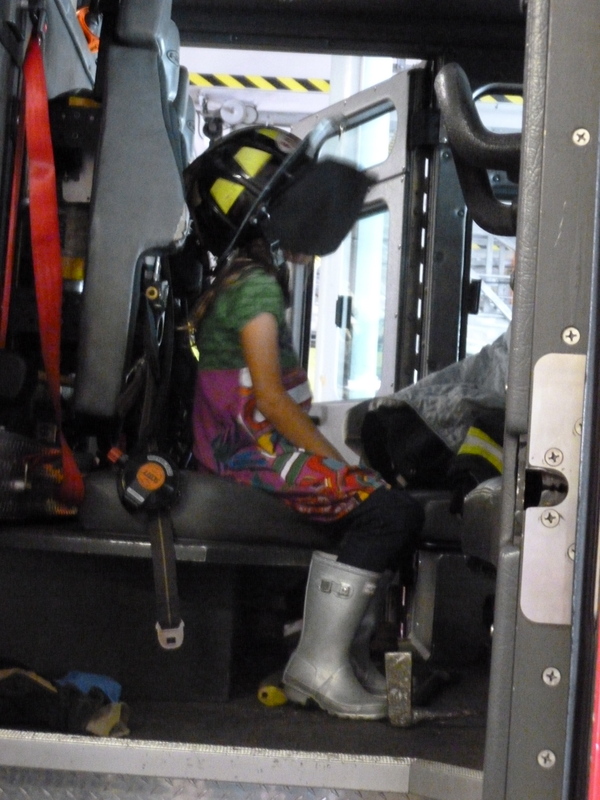 A HUGE shout out to our firemen – not just to the guys who showed my girls (and me!) such warmth and hospitality on Sunday, but to fire fighters everywhere who risk their lives every day to keep us safe. You are our heroes. If we could, we’d bring every single one of you a hot apple crisp and eighteen carat gold ice cream. Yes! My category will be lyrics from famous Broadway Musicals for a quart of 18 karat gold ice cream please! I hate to be the spoiler for everyone who comments below me but Google confirmed my guess – Age of Aquarius!! 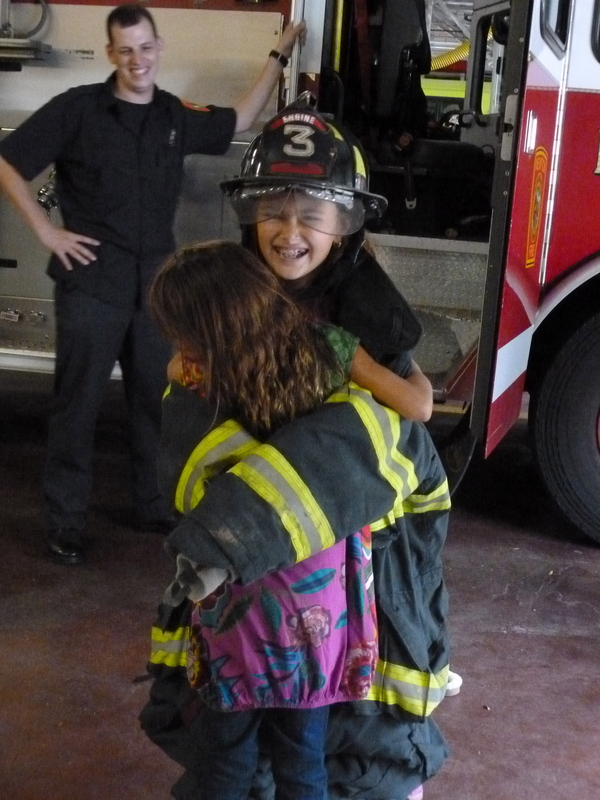 Love this post, love those firefighters, love your girls, love what you give them as a parent. Love it. Great work gals. Brooke fabulously captured a perfect likeness of a princess in distress on her card’s front! And FWIW, E was at one time as well versed in that Elmo video as Brooke is, as our frayed VHS box can attest. I’m smiling, laughing and crying! Thank you for this. I LOVE it! Love this entire post. So very very much! Love this. Your girls…they are priceless. What an incredible day for you and the firefighters! Your writing, not just the pics, lets me vividly see the moments, love it! As I literally lol’d, my son said to no one in particular, ‘i think she’s reading that woman again’. Heartwarming and hilarious, this is pure awesomesauce. And so is Firefighter Mike. Wish I could thank him personally for giving one of our kids a movie moment. I love it..!! What a great day, thanks for sharing it all with us!! I have to go with Luna. Thanks for a “movie moment”, Firefighter Mike. …and to the rest of the firefighters in the world, thank YOU, TOO. tears of happy for you…. Thank you so much for sharing, I always enjoy reading your blogs! Your girls are wonderful! 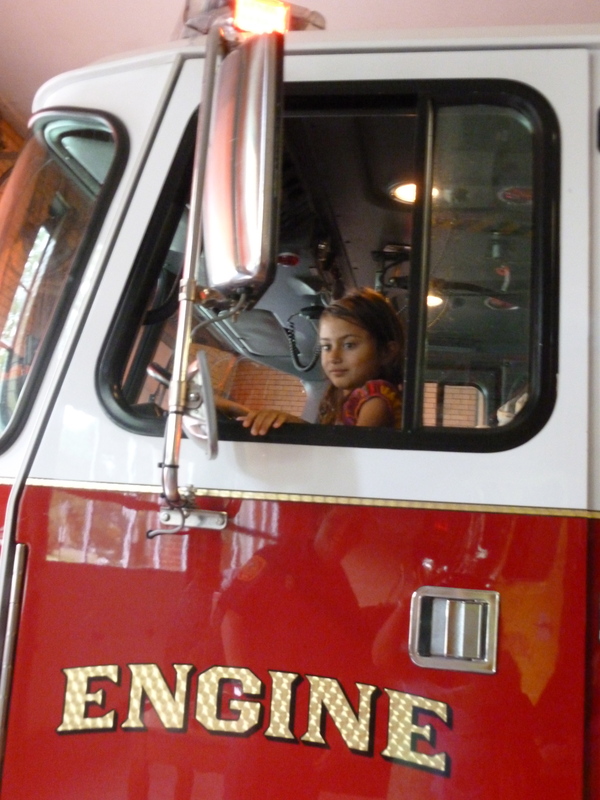 I’m with Luna – entire firehouse visit aside (and the awesomeness of it), the way you tell a story makes us all feel like we were standing right there. It’s a gift. Love the LOL moments you make sure to include – we all need them 🙂 Thanks as always for sharing – what a GREAT story this was. Thank you so much for sharing this, Jess. It is so exciting seeing Brooke’s progress and loving the relationships the girls have with each other. As tough as things get, you have a rockin’ family! 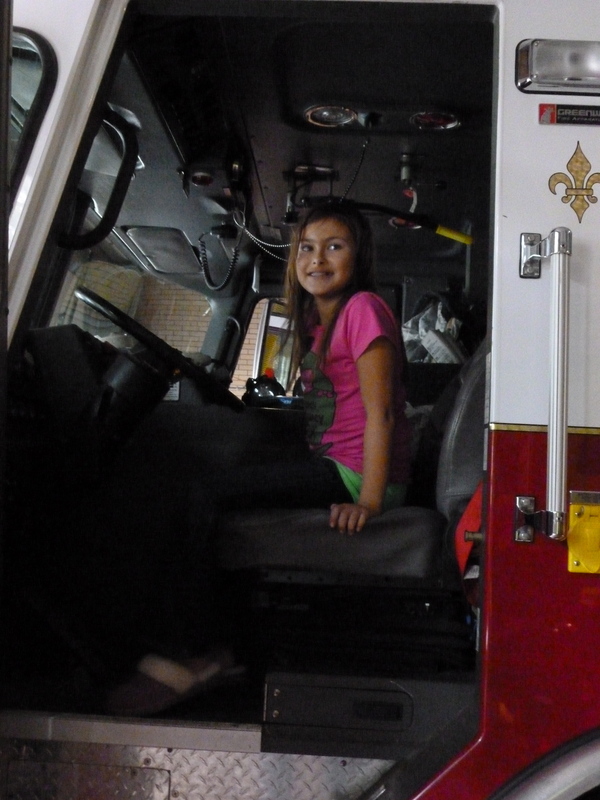 Thanks for sharing your day at the firehouse with your girls Jess. A memorable experience for all of you! Loved this entire post, but must admit, Katie’s comment to Mike was my favorite! That was wonderful! 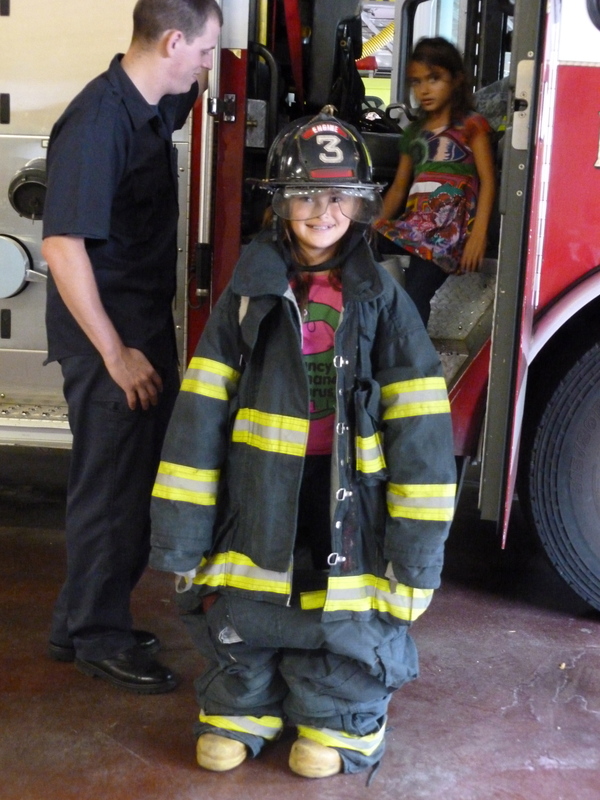 And it reminds me of my own kids’ trip to the firehouse with our home school group over a year ago. Our son loved the fire trucks, and the wonderful firemen gave the kids rides in the basket of the ladder truck. Our son wasn’t so sure he could do it, but he really WANTED to. The firefighters could see he was struggling, and so could his friends. Then one of his friends offered to go up with him, and I said I’d go too. So my guy, and myself and two of his friends, climbed into the basket with the fireman. At first, they only raised it a little. My guy was nervous, but excited. He relaxed a little, and said the fireman could take it up more. And more. The they spun it all the way around. My guy had the BIGGEST SMILE on his face, and I got pictures. He was so proud of himself! When we went down, he watched the next batch of kids go up. One of his friends was weirded out by the basket and wasn’t sure he could stand going up. My guy offered to go up with him! So off they went on the next round, and the fireman put the basket all the way up. What an experience for my guy, and for me. Writing about it now, I can still feel the lump in my throat over the “little” victory we had that day. Thank God for firemen – they are a special breed. 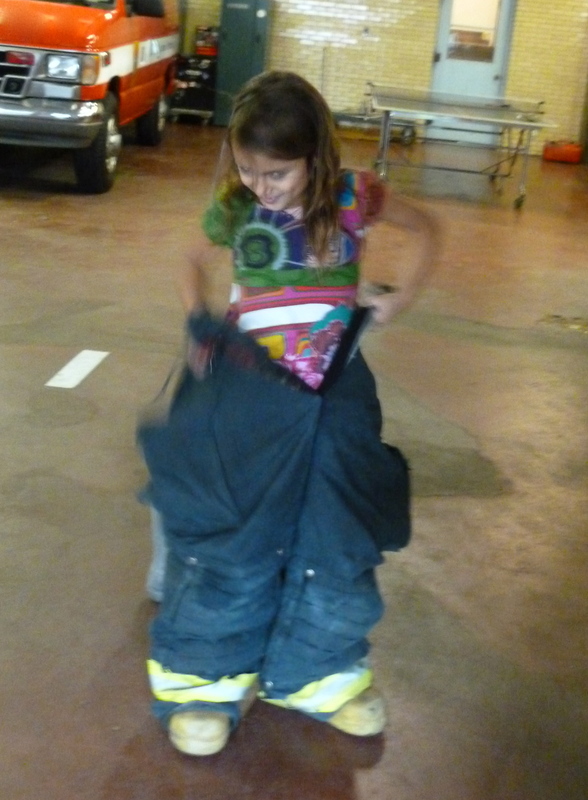 In fact, I think I might need to take our local volunteer firefighters some goodies soon. . . .
All kinds of ingenious! And what a great experience for both of the girls, and so thoughtful. Awesome! 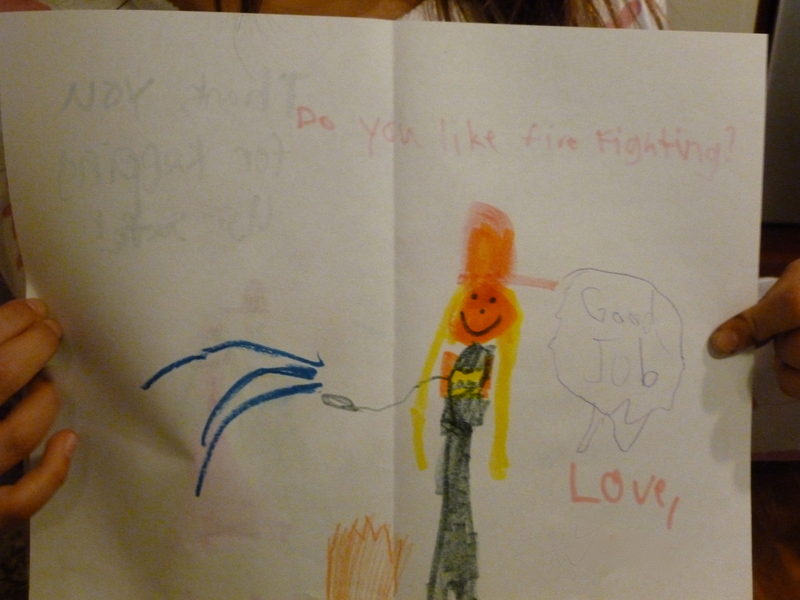 Glad you had a wonderful time visiting the firefighters.